Our Grain Free Chicken & Turkey dog food is also available in a savory, bone-shaped treat! Organically raised chicken is the first ingredient, followed by a hearty helping of chickpeas, whole garden vegetables and antioxidant-rich berries. Plus, cutting-edge ingredients like turmeric, apple cider vinegar, natural probiotics and pure coconut oil. 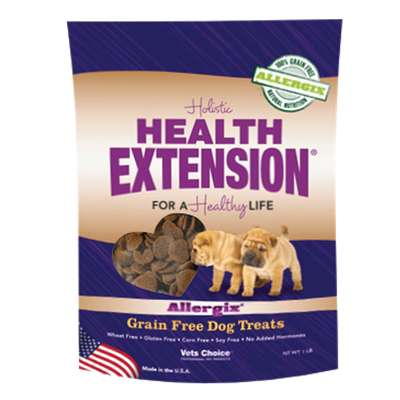 When you reward your dog or puppy with Health Extension Grain Free Treats, you know they’re getting complete and balanced nutrition in every bite. With organic, cage free chicken! Intended as a reward for good behavior. Formulated for supplemental feeding.